This book takes a minimalist approach to the traditional data structures course. It covers only those topics that are absolutely essential; the more esoteric structures and algorithms are left for later study. Suitable for an introductory data structures course or self-study, this book is written from the ground up in C++ (not translated from a Java-based text), and uses features of the C++ Standard Template Library to illustrate important concepts. A unique feature of the text is its use of literate programming techniques (originally developed by Donald Knuth) to present the sample code in a way that keeps the code from overwhelming the accompanying explanations. 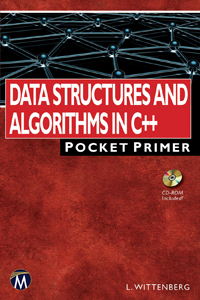 This book is suitable for an undergraduate data structures course using C++ or for developers needing review. Takes a "minimalist" approach to the material that presents only essential concepts. This enables readers to focus on (and remember) just what they'll need. Uses select features of the C++11 standard to simplify the sample code and make it easier to understand. Connects the concepts directly to the classes provided the Standard Template Library (STL), and shows how these classes can be implemented in C++. Uses "literate programming" techniques that allow the presentation of the sample code to more clearly show the details of the code as well as how the pieces fit together. 1: C++ Review. 2: Algorithm Analysis. 3: Linked Lists. 4: Stacks and Queues. 5: Recursion. 6: Binary Trees. 7: Binary Trees (Continued). 8: Sorting. 9: Hash Tables. 10: Graphs. Appendices: A. Programmer's Library. B. STL Class Summary. C. Chunk Index. Index. Lee Wittenberg (Professor Emeritus/Maryville College, TN) holds a degree from Stanford University and has taught computer science courses for over thirty years. He continues to teach as an adjunct instructor and was formerly an employee of Bell Labs.